Rescue Hovercraft – Hovercraft are very useful for flood, mud and ice rescues where it is impossible to use a boat. Boats are pretty useless on ice and mud. During floods, boat propellers get snagged up on street furniture, wire fences and plastic bags floating in the water, hovercraft have no propellers. Hovercraft are also good on fast running water that would sweep a boat away. Hovercraft also have a vital role during post flood operations – most of the flood water becomes contaminated by raw sewerage, so it is dangerous for rescue teams to push inflatable boats. 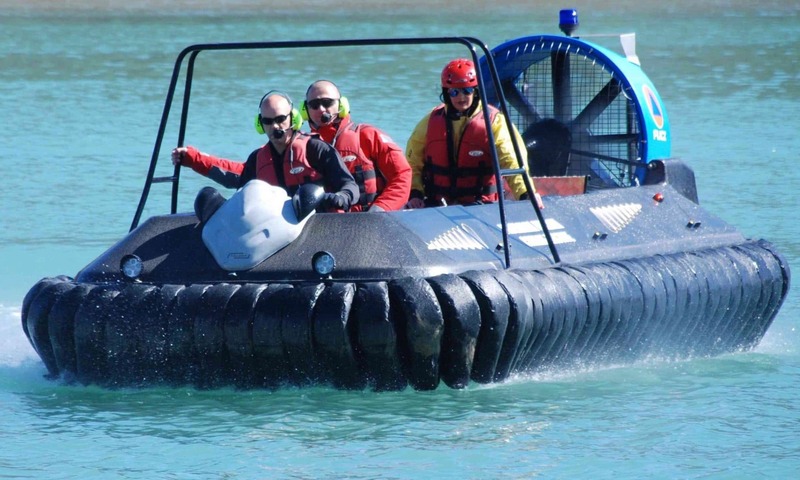 Because hovercraft are weight sensitive, check what weight can be lifted from an on-water start – drill down to specifications since all hover craft generally carry 50% more weight when starting on land, and some suppliers fudge on-water payload ratings. For flood rescue work, you need a 3 or more seater hovercraft with on-water payload greater than 300 Kgs, to carry the driver, the paramedic, and the victim. For ice rescue work, steer clear of glass fibre hovercraft since these can crack on ice. Choose a hovercraft manufactured from HDPE, Carbon Fibre or other materials. Check skirt materials – avoid neoprene coated nylon and Hypalon – neoprene degrades when exposed to UV sunlight, and Hypalon tears too easily. Choose Polyurethane coated anti-rip nylon, preferably 375 gsm. For mud rescue, victims get trapped and can die from incoming tides (drowning) or suffer from Hypothermia, so it is essential to reach the victim as quickly as possible. To release the suction of the mud, carry a CO2 lance to blow into the mud below the victim’s feet to reduce the suction pull effect – trying to get a victim out of the mud with releasing the suction can damage the spine and cause long term back injury. Why not to use helicopters for flooding? People climb things like pylons and trees when water reaches up to their neck, helicopters don’t like pylons, and tree cover can hide a victim. Helicopters have zero communication with people on the ground. Helicopters cost a fortune to buy and operate, they need specialist pilots and winch-men. Helicopters generate 100 mph downdraft winds that hamper rescues – for this reason, they have to employ very long winch cables and the time to send a winch man up and down the winch takes time – how long can you tread water? Using weight sensitive helicopters to transport fresh drinking water is bonkers – water is heavy, 1 Kg per Litre – use hovercraft to deliver water purification bottles, makes far better sense.